Everything in music since 1971! All rental payments apply to purchase. You may return the instrument at any time, providing rental payments are current. There are no finance charges ever! A maintenance cost is included in your monthly rental fee but does not apply towards the purchase price of the instrument. Renter shall have the option of renting the instrument continuously until the instrument is paid for. The purchase price of the instrument shall be the TOTAL PRICE less any sums paid pursuant to this Agreement as Rental Fee. Discounts: The Company will allow a twenty (20%) percent discount from Renter's balance in the event Renter provides payment in full, provided Renter's account is current. completing the Online Rental Process. Now you can maintain your own account for your rental instrument! A quality school band instrument is an investment in your child's future. But what if your child decides to change instruments or - worse yet - drop out of band entirely? Your investment becomes a garage sale disappointment. Not only that: suppose your child loves band, but his or her instrument becomes damaged? 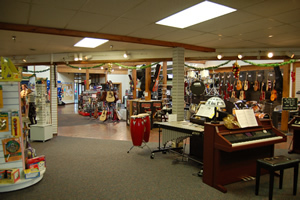 Your rental applies toward the purchase of the instrument! - and it covers all repairs, too! If your child decides to change instruments within the first 6 months of rental, just get your band director's approval. It's fine with us, and we will credit any rental fees you've already paid to the new instrument. If your child drops out of band, just return the instrument to us. $4.00 Clarinet, Cornet, Flute, Percussion Kit, Drum Kit, Trombone, Trumpet, Violin. $6.00 Alto Saxophone, Baritone, French Horn, Oboe, Tenor Saxophone, Wood Clarinet, Cello, Viola. This cost is included in your monthly payment but does NOT apply towards purchase price. Renter shall have the option of renting the instrument continuously until the instrument is paid for. The purchase price of the instrument shall be the TOTAL PRICE less any sums paid pursuant to this Agreement as Rental Fee. provides payment in full, provided Renter's account is then current. Cash price is TOTAL PRICE less 30%.